A zoomed-in view of the shiny protuberance. Credit: NASA/JPL-Caltech/Malin Space Science Systems. As we reported last week, images from the Curiosity rover showed what looked like a piece of shiny metal sticking out from a rock. Some of our readers suggested that it might be a handle or knob of some kind. 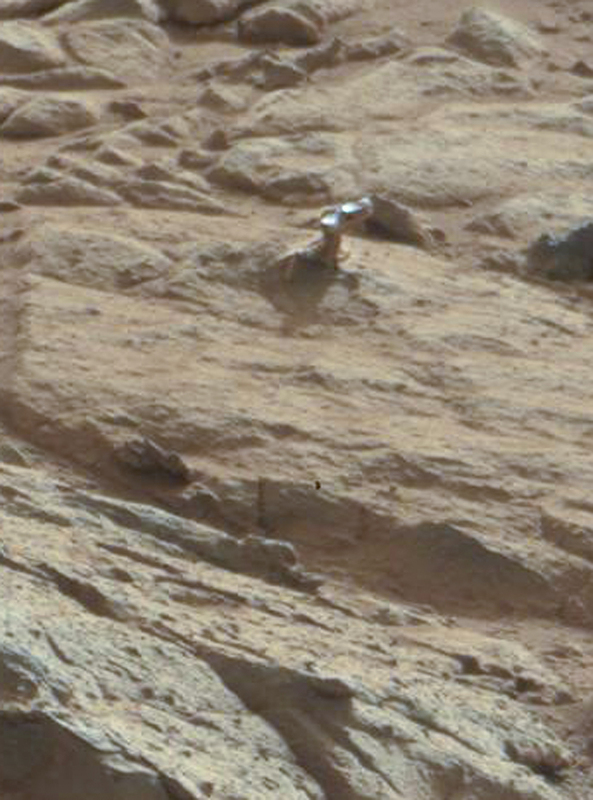 It’s a knob, yes, says Ronald Sletten from the Mars Science Laboratory team, but a completely natural formation. Sletten, from the University of Washington, explained that, not surprisingly, it is actually a part of the rock that is different — harder and more resistant to erosion — than the rest of the rock it’s embedded in. Read more: Scientist Explains the Weird Shiny Thing on Mars — Universe Today.